As I sat down at the computer to write this entry, my three year old came running inside (naked from the waist down, but wearing a silk cape and carrying a stuffed felt sword) to inform me that "there was a dead bee outside and it’s so sad, I think I’m going to cry." His fifteen year old brother was trailing behind him, managing to keep a straight face. "C’mon mom, I’m going to show you," he insisted. We went outside to see the bee and to make a nice resting place for him in the dirt. Sometimes I need these gentle reminders of what really matters — those simple, peaceful, even slightly sad moments, where we put aside the work we are doing or, in this case, our simple indulgences, and take time to look at the small things that matter to our children and families. His baby face is so sweet. I feel so very fortunate in all of the important things. I want to share the results of my recent foray into the garden — for those of you who remember the basket full of herbs from the other day. 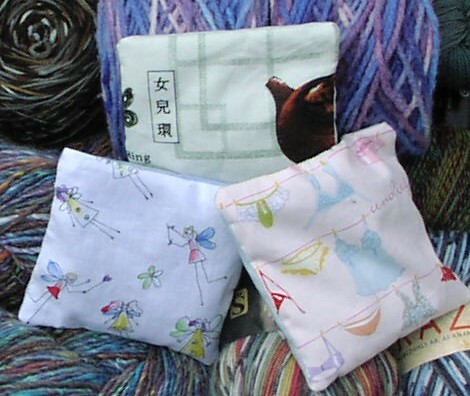 I’ve dried my blend of anti-moth herbs and sewn the first batch into sachets. 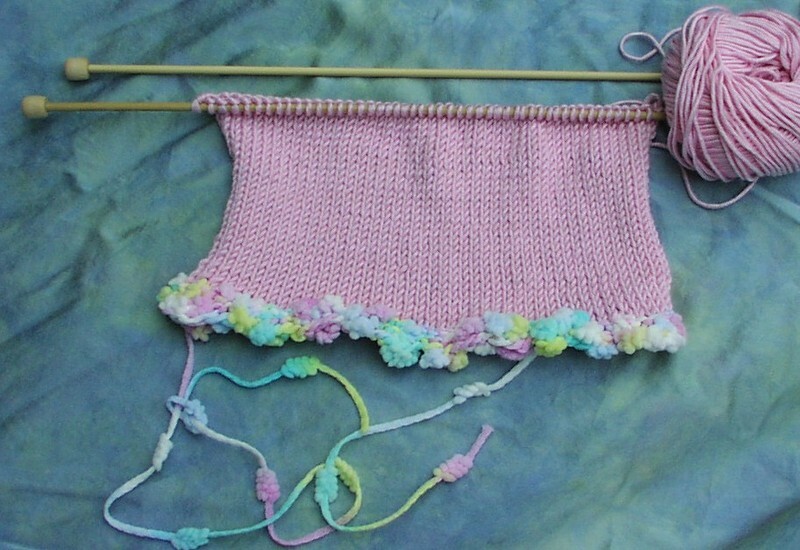 In the new on my needles category, this sweater is for a friend who is pregnant with her first girl. I don’t usually do the foofy edging stuff, but I saw this yarn, Filatura di Crosa Bon Bon, knit up at my local yarn store, and really liked it for a baby sweater. The pink is heavenly, divine bamboo yarn. I am totally in love with it, although its low twist makes it a candidate for splits if you aren’t careful. I think this same combination would make a wonderful back to school skirt for my daughter. ← Oh look! Progress Bars! It is sad when the good bugs die. The Bon bon yarn makes a perfect edging doesn’t it? and that colourway is perfect with the pink. love this!! and oh moth repelent!! too fun!!! I should be doing that!!! not sure though I have the right herbs any more!! have to redo the herb garden next year!! lots of veggies in there now!! Thank you for posting about “Sometimes I need these gentle reminders of what really matters” This is oh so true so quickly their younger years pass by. Wow! I love this pink combo! Reminds me of dot candy… mmmm paperlicious! 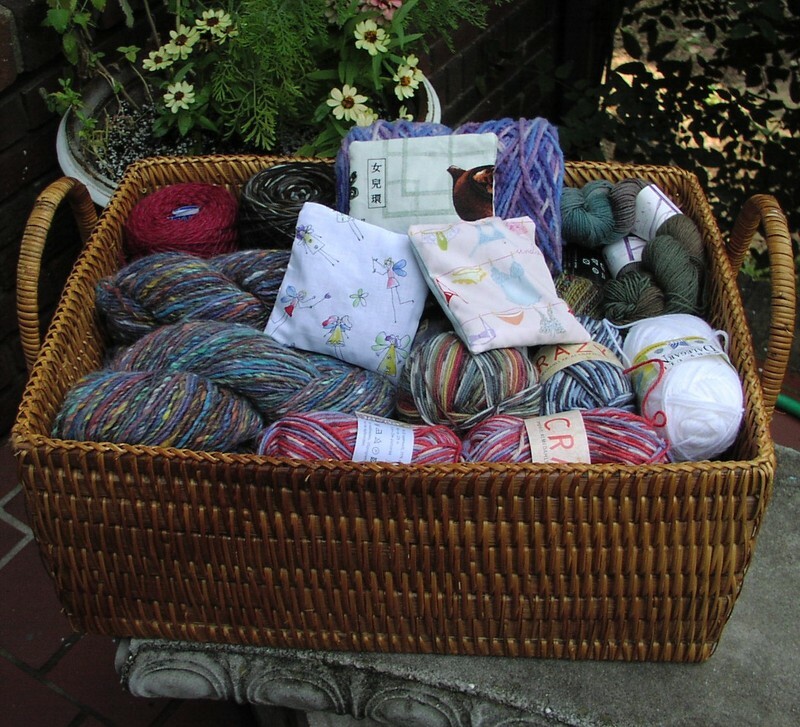 Look at all of that yummy yarn! I want to pet it!